As a child, I loved getting the mail. I watched impatiently as the postman turned his vehicle onto our street, first delivering letters on the other side. Sometimes I stood at the edge of the driveway to track the truck’s progress as it lurched from one house to the next, the driver oblivious to my eagerness. Bashful, I frequently retreated as the truck got closer rather than greeting the mail carrier as he pulled up. After he had deposited the mail and driven away, I scampered outside and opened the box. Sometimes it contained a tissue thin blue aerogram from one of my father’s few surviving relatives, flung far apart after the Holocaust. Filled with exotic inky scrawls, they were both mysterious and comforting, proof I was part of a larger familial web, even if mostly invisible and with far too many broken or missing threads. I don’t know what all these missives said, and some of the senders I never met. I just know that these letters were precious to my father. I became a letter writer, too, sending my own wispy correspondence to friends and family when abroad, using regular envelopes when I was in the United States. The near absence of extended family in a world where most of my friends had two sets of grandparents contributed to a deep sense of difference. Without being completely conscious of it, separateness became a fulcrum of my identity. I observed if not catalogued the many ways in which I believed I was not the same as others. My mind manufactured all kinds of explanations for differences, actual and imagined. Some, like being an introvert, were real, although I was unaware of it at the time. I became vigilant against stereotypes, or groups that reinforced a common outlook. I preferred bucking the norm to accepting it unconditionally. My reactionary tendencies contributed to my decision to manage a franchise of College Pro Painters for two summers in college, in the mid 1980s. I wore paint splattered pants and motored around the suburbs of Boston in a creaky white van, my way of giving the finger to ideas about what women (especially Jewish women) were supposed to do and look like. Part of that adventure included clipping a pager to my waistband so that my crew and assistant could reach me. While the pager helped solidify my identity as “different”, whenever it beeped my heart pounded and adrenaline surged in anticipation of bad news…did one of my employees bust a window? spill paint on a driveway? When the season ended, it was a relief to rid myself of it. No more startling interruptions. I didn’t understand how doctors could live with such a gadget, even if it gave them an air of importance and an excuse to disappear from tedious social encounters, no questions asked. When cellphones arrived I balked, remembering the disturbance of the pager. It took a minor automobile mishap to convince me of the need to have a cellphone at all. That was in 2001 and I carried the device with a sense of resignation, not celebration. I would have gladly turned the clock back to when the postal carrier delivered letters instead of junk mail and telephones had cords as curly as confetti. Then, I easily remembered the phone numbers of my friends. In 2007, when Apple released its first iPhone, I was largely indifferent. As I vaguely recall, its price was in the three figures and only available through AT&T. I was both frugal and had service through Verizon. I didn’t understand the appeal, why anyone would want their phone to take photographs. Isn’t that what cameras were for, and didn’t real cameras do a better job? I was suspicious of housing too many functions under one roof, of becoming too dependent one thing. Since getting my first cellphone, I’ve been loathe to upgrade, only exchanging them when they stopped working. Not being a tech aficionado, I simply cared that it worked and held a charge. E-mail and texting did not interest me. In my mind, I was like the little Dutch boy, sticking my finger in the dike to keep the tide of technology from overwhelming my stubbornly held notions of civilization and my own identity. But the longer I stood there as the world whizzed by, the more I wondered if I were a noble holdout or a cranky contrarian resistant to the flow of modern life. Was I protecting my sense of self or simply afraid to dive in and surf the wave? A few years ago, after finding myself wishing I could check e-mail while out and about, I sprung for a small data plan on my basic phone. Since then, Verizon has periodically sent me offers to upgrade my phone (and up my monthly bill). Those I’ve tossed into the recycling bin. Still, watching people enjoy their smartphones, with all the apps and features, tempted me to get one, too. With the technology improving, I had to admit it might be more convenient to just carry one device, instead of a cellphone, a slim camera and a pocket digital recorder I use frequently. Even my Zen teacher and her off-the-grid monastery have figured out how to use smartphones in service of awakening (e.g. using timers for mid-day meditation sessions) rather than as a distraction from being present. While flying last year, I wondered if it might be simpler to check in electronically, rather than having to print and carry boarding passes. Ditto for coupons. Yet, until recently, the data plan alone for such a device was $30/month, an unjustifiable sum considering my usage. Ten days ago I received a flyer from Verizon with a limited time offer for a free iPhone 5C. That Apple had released its fifth iteration phone was news to me. The slogan, “for the colorful” drew me in. I read the fine print. It said plans started at $45/month, my current rate. The activation/upgrade fee was “up to $35”, not a deal breaker. There seemed to be little to lose, except the excess weight of my camera and recorder and some of my old beliefs. Still, one snowy afternoon I went to the store to make sure I had understood the offer correctly. After a tedious wait I learned that I had, except for smartphones the basic plan began at $55/month. For this Luddite, they’d waive the upgrade fee. I reckoned that the extra $2.50/week would be worth the convenience. I chose the cheery yellow, expected to ship next month. The salesman, whose stubbly jaw recalled a forest after a fire, asked me if I wanted to purchase a case so I’d have it when the phone arrived. The available cases ran $30 and up, insanely high for a plastic sheath. At home, I checked online. Some, identical to those in the store, were $7.99. 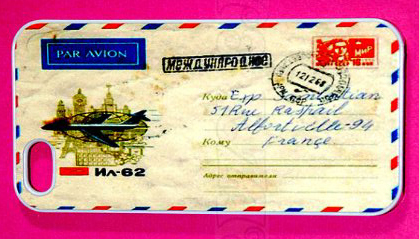 And there was one designed like a “vintage” postcard, complete with a blue par avion motif, like those I remembered. I considered getting that model, to cast a thread between past and present, to recall an era when the rumble of the mail truck, not the ping of a smartphone, made my heart beat faster. « Commitment: to Process or Outcome?